Breathing may seem like a simple enough task and you're probably confident with your breathing abilities, but I'd like to address this topic since it's something many people take for granted. Respiration is usually carried out for us by the autonomic nervous system , and when we are on auto-pilot, it's easy for us to forget about it. The respiratory system facilitates the exchange of oxygen and carbon dioxide in our bodies. If we stop breathing, we may die after several minutes due to lack of oxygen. If you've ever had the wind knocked out of you, choked on something, experienced sleep apnea, or had an asthma attack, you know how much panic and distress it causes your body when you can't breathe properly. When lifting weights or doing strenuous activity, it is important to exhale during the most difficult part of the exercise while you are exerting the greatest force. This controlled exhalation is called the Valsalva maneuver and can keep you from passing out. Technically, Olympic and power lifters looking to set world records may not always adhere to this, but for most people, the practice of controlled breathing as opposed to holding your breath should be followed when lifting weights. When our bodies are under stress or exercising, the oxygen demand increases and as a result we breathe harder. Sometimes we experience an oxygen debt after a quick burst of activity. Think of the times you run up a flight of stairs and say to yourself "that wasn't so bad", only to be hit by a loss of breathe a few seconds later. It's easy to think about our breathing when we are exercising, but it is also important to remember to breathe properly when you are at rest or just sitting around. Many people develop the habit of shallow breathing. I find myself doing this and at times wonder if I could even fog up a mirror when I'm sitting still. Shallow breathing can be caused by poor posture, restrictive clothing, injury, pregnancy, illness, or a host of other reasons. To avoid this, breathe deeply with your diaphragm and fill your lungs. It is amazing how much difference taking a couple deep breaths can make. Practicing deep breathing is kind of like re-booting your computer after it crashes. That is why when someone is injured, in shock, or hysterical, getting them to take deep breaths helps calm them down and relax. 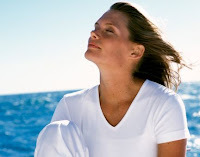 Breathing properly can help you reduce stress, relax, and decrease anxiety. No wonder it is an important component of yoga, meditation, and bio-feedback. The next time you are stressed out, nervous, or feeling anxious, try some deep breathing for several minutes and notice how it makes you feel.